The Olympics may be over, but soon the Paralympic Games 2016 are coming to Rio. I think it’s safe to assume that we all agree that the Paralympic athlete is amazing. Competing in these games with a disability, I think we can also agree that the Paralympian does not let their disability define their limits. I was excited to discover that the Paralympic committee has designed a series of workouts called ParaTough, where we can train like an athlete and gives us a small peak into what these athletes do stay on top of their game. Yes, new workouts excite me! You won’t need all this equipment for every workout. It all depends on the workout you are doing from the Paratough series. The first workout I tried was The core stability workout, led by Canadian Paralympic swimmers Aurelie Rivard and Benoit Huot. For this workout you will need a medicine ball, a box or step, an exercise ball and a kettlebell or a dumbbell. An exercise mat is suggested for doing the exercise ball hamstring curl. There was also a good portion of lower body work in this workout. Squats, lunges and stabilized wall squats were included. I was never a fan of holding the stabilized wall squat. Although I consider my legs to be the strongest area of my body, this is a grueling exercise for me. Get ready for the leg tremble! I had to hold this for one minute, which to me seemed like one hour. Next I moved on to the cycling workout with. A nine minute workout but not lacking in the intensity department, is led by para-cyclist Ross Wilson. Either a spin or stationary bike will do for this workout. I went to the spin studio to try this one out. I have not been on a spin bike in a while and will be feeling this workout tomorrow. Since I tried the workouts that target core and legs, I ended with a back and shoulder workout, led by athletes Pam Lejean and Becky Richter. For this workout you will need dumbells or plates, a resistance band or cable pulleys and a weighted bar or stick. What I liked about these workouts is that they are short, yet very challenging and can be the perfect change to mix things up in your workout. You can also do them as a circuit workout, adding rounds to make them longer if you are a glutton for punishment crave an added challenge. During the workout, the commentator also gives you a little bio about the Paralympian leading the session, and why they focus on the exercises they do to aid in training for the games. 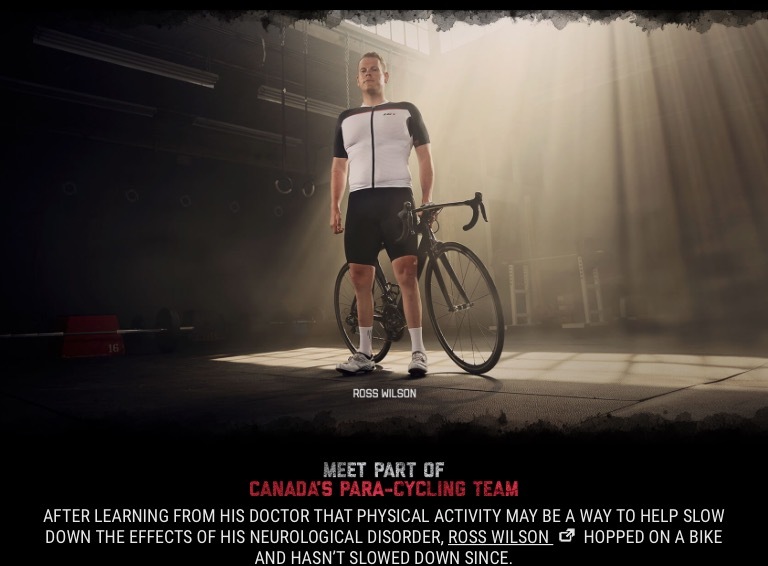 I was amazed to learn that Ross Wilson started cycling after his doctor told him that physical activity would slow down the effects of his neurological disorder. The rest, as they say, is history. I agree, Fran. The Paralympic Games are always playing second fiddle to the Olympics. The bios are so interesting about these men and women. As the kickboxing instructor says at my gym, “any workout can be modified.” Give them a try! How fun! Definitely motivating trying to keep up with them! Absolutely! The athletes were up to about 15 burpees and I was just mustering up 5. Lol. It’s fun to compare. This looks tough. I commend these athlete! They put many people to shame with their athletic abilities! That’s what I said! The workouts were a nice challenge. SOOOOOOOOOOOOOOOOOOO inspiring & so glad you shared!!!!! Thanks Jody! I was really inspired by this program. Let me know how you liked the workouts if you tried them. Amazing athletes. I hope to catch some of the Paralympic games. The slogan we see often these days “no excuses” can definitely be applied to these athletes. Thanks Nat! These workouts look intense and talk about inspriing! Wow, if they can do it anybody can! Love it! Exactly! I loved trying the workouts too.